I received my LM-7s today (7/4). The photo doesn't do this one justice, folks. The detail and shading are simply gorgeous "in the flesh." This might be my favorite of the series so far. I would have to agree. The detailing in the mountains give the scene an almost 3D effect when the patch is tilted slightly from side to side. Great job Chris. See this thread for the full announcement. Note that I hope to have LM-4 sometime next week and LM-5 not too long afterwards. Chris, received my LM-7 and 11 patches. As the others they are really great. Thanks a lot. Great job of LM-4 Chris. Looks just great. Chris, thanks a lot for two great patches: LM 4 and 9. I've just received my LM-4s and LM-9s from Chris, and both look terrific, as expected. I'll add my sentiments to those praising Chris's decision to go with a "cut" design for LM-4...Now that I have one in my hands, all I can say is "Good call." Please see this post for the full announcement. I received my LM-5s today; I now have the complete set. They'll look gorgeous framed together, and make a terrific visual tribute to the people who designed, built, and flew that utterly unique machine. Thanks again to Chris Spain for going to the effort and expense of producing these, and to AB Emblem for doing an outstanding job converting some very difficult artwork into embroidery. 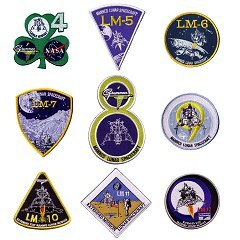 My collection of LM patches is "complete," too. A great set of patches. Many thanks to Chris for going through all these challenges to get this on it's way. AB Emblem did a great job and Chris much more of that to discuss this with AB and to organize all the needed things. Again, thanks a lot for a wonderful LM patch set. As another very impressed and satisfied customer I'd just like to add my congratulations to Chris for a job well done. For those still sitting on the fence for whatever reason - don't. The set is really excellent and a fitting tribute to the Grumman - NASA LM team. A truely wonderful set of patches, Chris. This project will have given you a load of work - I think collectors now owe you a well deserved break. Just to echo the sentiments expressed here, this has proven to be a superlative piece of work of which Chris can feel justifiably proud. The research and attention to detail as well as the accomplishment in guaranteeing the patches reflect the artists original intent has been outstanding. A first class job all round. I've now received my complete sets of these fabulous LM patches, and would like to praise Chris for all his fantastic work in reviving this project, and seeing it through to it's conclusion. Many thanks Chris. The patches are very nice indeed. 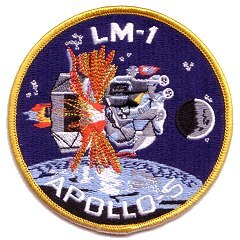 But wasn't there a patch for the Apollo 9 (LEM 3) mission? The LM-4 through 12 insignias were created by the Grumman teams working at the Bethpage plant and produced as decals and prints, never as patches. The LM-1 patch is certainly original but was likely produced at KSC, not Bethpage and only ever existed as an embroidered patch. As such it does not fit directly in the set I produced. The LM-3 patch is still something of a mystery. I've never seen a decal or print of any LM-3 artwork so it's not part of that set. Maybe it was produced at the time by someone but I'm not 100% convinced. The fact that it's a very crude design doesn't help its case either. 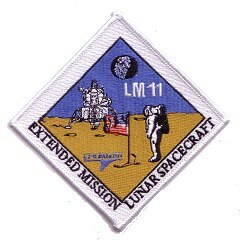 There's also the LM-13 patch which I'm pretty sure is a modern 'fantasy' creation. I've certainly not seen a vintage decal or print of the design. Anyway, that's my take on the other Grumman LM insignias and why they don't form part of my project. I might make an LM-1 replica at some stage but that would be a separate project. Does anyone know if all the original Grumman Lunar Module insignia, LM-4 through LM-12, were produced as stickers, water release decals and prints, or were just some and not others? I'm just wondering if there are three variations of each insignia. 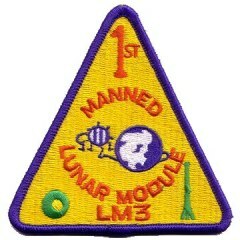 There is no-one on collectSPACE that could verify the LM-3 patch? Yes, I can, as I didn't see this topic earlier. 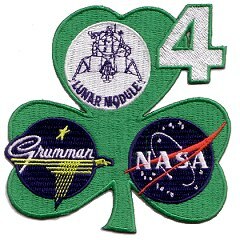 Anyway, the small LM-3 patch was indeed produced by Grumman mainly for their workers here at Kennedy. My sources are coming from retired Grumman lunar module checkout and test team members, that I am still in contact with and have known for years. Indeed, the original triangular-shaped yellow-red-blue patch is extremely hard to come by (I only have two of them) and it would appear that most Grumman/KSC workers do not have them either. It appears to be a vintage patch, and although the rather crude design does not form part of the series of LM insignias produced by the Grumman teams working at Bethpage it may possibly have been produced by a Grumman employee based at the KSC. Ken's post above appears to confirm the KSC origin. While at the Barnes and Noble at the Smith Haven Mall, I stumbled upon the book Building Moonships: The Grumman Lunar Module which shows the insignia for LM-13 as well as for LM-14, which was to be used on Apollo 20. (And interestingly, the book asserts that LM-9 was to refurbished for use on Apollo 18, with Cradle of Aviation's LM-13 slated for Apollo 19 and LM-14 for Apollo 20. Huh. Right you are, on the very last page. The author of the book is Joshua Stoff, who as of the book's printing in 2004, is (according to the back cover) author of sixteen books on aviation and space history [and] curator of the Cradle of Aviation Museum on Long Island. The back cover also says that "the book includes many never before published photographs from the extensive archives of the Cradle of Aviation Museum." This lends support to the idea that the LM-13 insignia was real. (Although why wouldn't it have flown on Apollo 18, not 19 as it asserts?) Evidence, not proof - but given the proximity of CAM to the former Grumman facility, it's more compelling than if it came from some other source. I had a quick look (very quick!) at the CAM website but didn't see a staff listing link, so don't know if Stoff is still at the museum. I love these patches! The only weird grumble I have and its no fault of Chris is who ever designed the LM-4 patch wasn't thinking to clearly. Why would you use a three leaf clover and not a four leaf for LM-4? Plus a four leaf has better luck anyway. I received my LM-1 patch today (together with the LM-4 patch). Chris, You did a great job on doing this LM-1 replica! It looks BEAUTIFUL! I can only say that this again is a wonderfully executed patch. Received mine today and it looks just fabulous! If it were not for the "made in China" sticker on the back you would think it was an original. I compared the two and it is really well done. Yes, the patch looks fantastic and I highly recommend it to anyone who might be sitting on the fence. A great looking patch that really tops off the previous patches in this series. Beautifully done! Thanks Chris. Great, Chris! You did it! I was real waiting for this one. I have collected one Apollo astronaut's autograph per flown mission and framed it starting with Apollo X together with the matching Lion Brothers patch and your Grumman replica patch (for the Apollo 7 and 8 missions I had a Lion Brothers and 25th Anniversary patch to have two patches framed with the autographed picture). 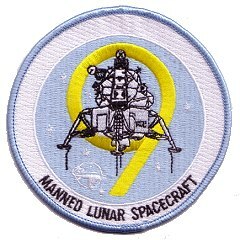 On edit: I have put your beautiful LM-1 Patch in my collection of Apollo patches. Has there ever been a LM-2 patch? I received mine today. 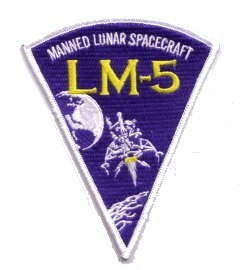 Another fine LM patch! Thanks Chris, for doing these wonderful series of patches. I received my LM-3 patch yesterday, and second the above posters' comments. Another excellent rendition, commissioned by Chris! Thanks, Chris. Order placed. The LM-3 patches arrived the other day and look great. Thanks for doing these series(es - if that is a word). Top notch all the way. Thanks from me too, Chris. Placed my first order yesterday. From reading these posts, I'm looking forward to getting my first few. Sounds like I'll be ordering the rest of them too. 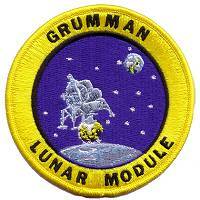 I have produced a new patch based on the vintage Grumman Lunar Module insignia usually seen as a decal. It's now available for pre-order - See announcement here. Look great, Chris! A great addition to your excellent line of reproductions. Received my Grumman Lunar Module Patch today in the mail from Chris. Great job Chris and thanks!